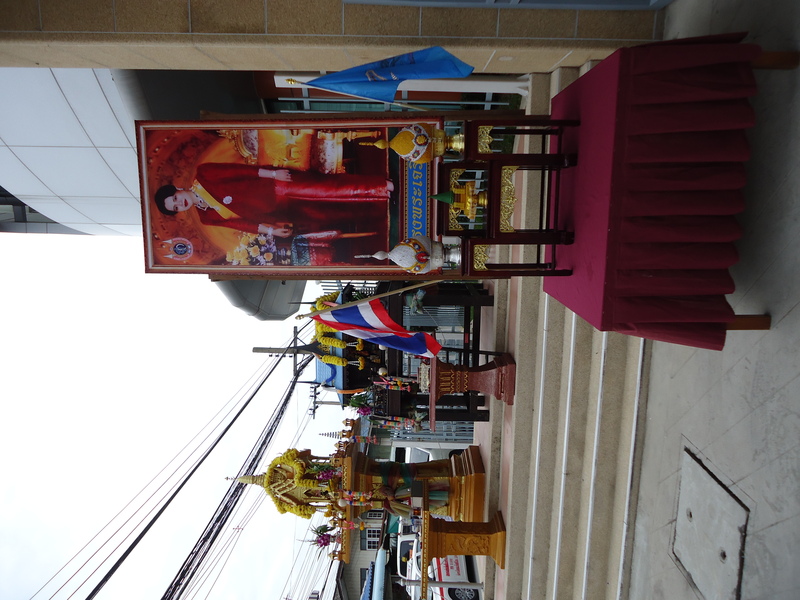 It was The Queen’s Birthday this past weekend, which meant that Thailand had a stat holiday on Monday. In Thailand, not only is The Queen’s Birthday a holiday, it serves as Mother’s Day for the entire country. Now that is royalty with real power! In case anyone forgot that it was The Queen’s Birthday, there were displays along all the major roads, and, more importantly, in all the malls to remind them. Most of the new teachers decided to celebrate the three-day weekend by travelling to Ayutthaya, the site of Thailand’s historic royal city. 16 of us crammed into a mini-van with seating that will forever after make economy class feel spacious to me. Every time we clambered out of the mini-van, I could hear most of the teachers counting us off – they just can’t help it. Herding adults is infinitely worse than herding students – you can at least threaten students with detention, and I’d bet money that they have better impulse control when confronted with food carts. 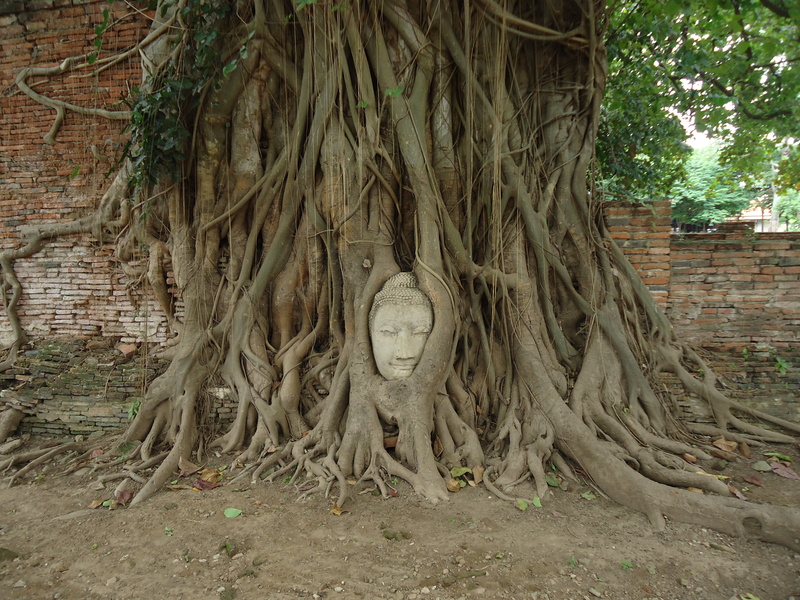 Ayutthaya was an intriguing place to visit. We learned about it in Thai Culture Class, and it was great to see it in the flesh. 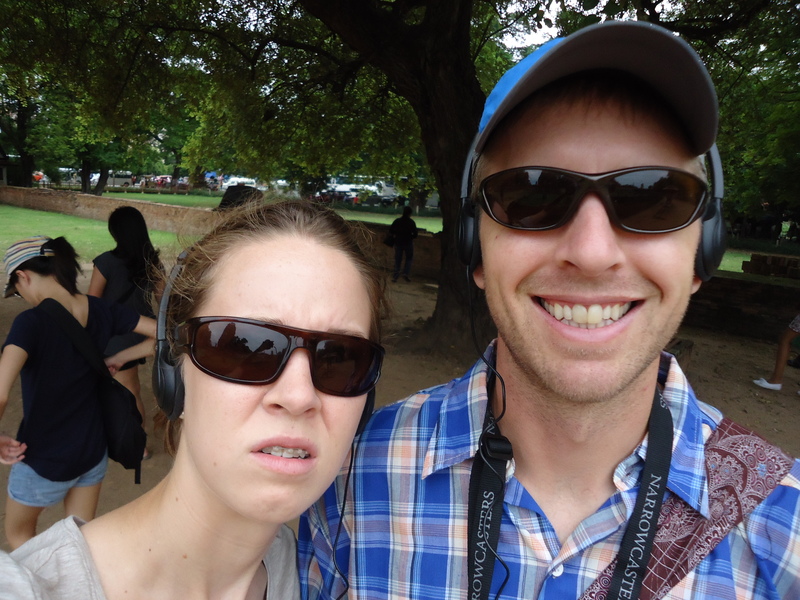 At our first stop, Wat Phra Mahathat, Todd and I decided to enhance our historical experience by renting an audio tour that came with two headsets. This lasted for about 5 minutes, after which I gave up on the history and meandered off by myself. I prefer to absorb information via osmosis. This tends to leave me with fewer facts but fonder memories. I don’t care if I’m in the land of Siamese twins – I just can’t handle the conjoined thing. We wandered around the first site for a while, and admired the ruins. 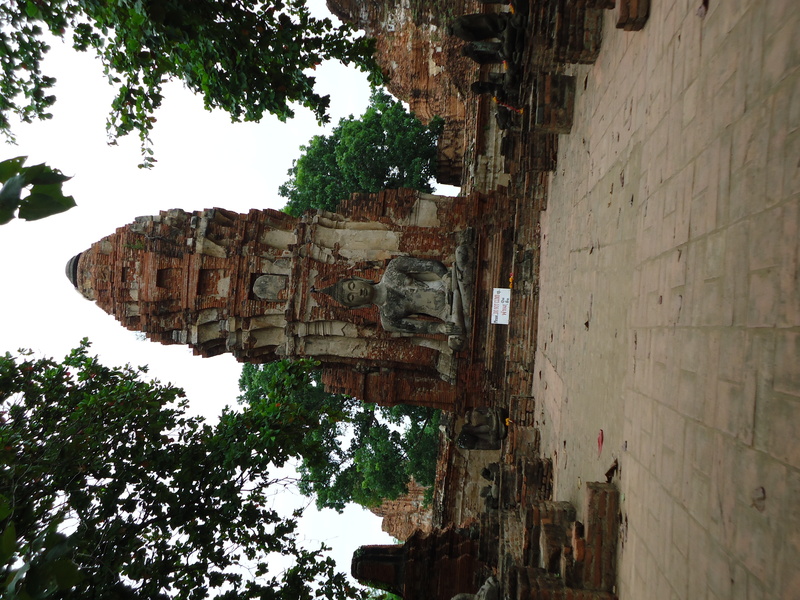 If I remember correctly, the Burmese invaded Ayutthaya in the 1700s, and sacked the joint. Check Wikipedia if you want more facts. 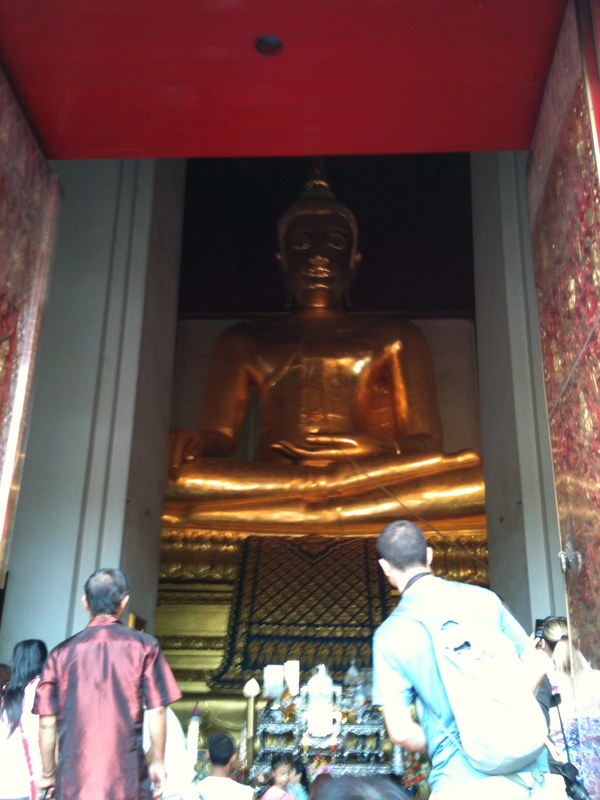 After lunch we visited Viharn Phra Mongkol Bopit, a temple that houses a massive bronze Buddha. 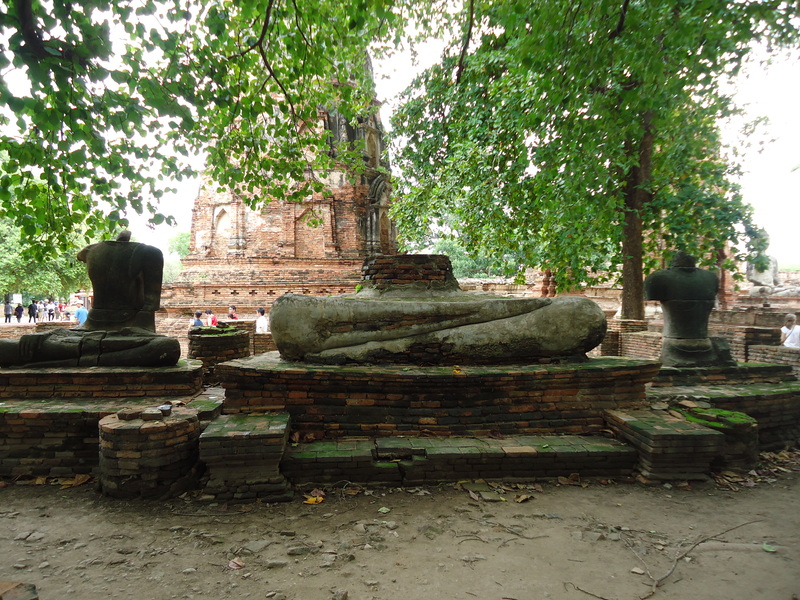 Nearby were the partially restored ruins of another temple complex called Wat Phra Si Sanphet. In my wanderings, I somehow missed the ruins, and found myself in the opposite corner of the large complex. I was confused, as there didn’t seem to be anything of archaeological interest going on, although the bathrooms were extremely clean. 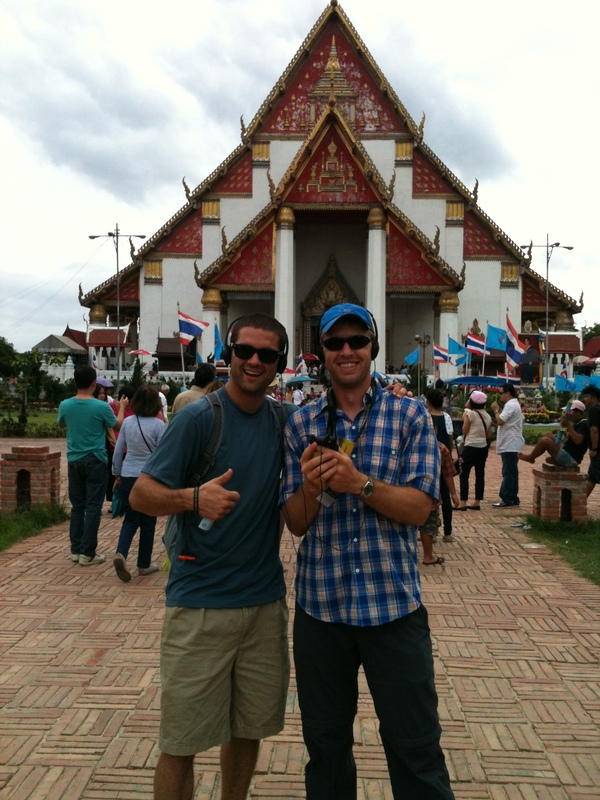 While I was gone Todd found himself a much nicer friend than me, and spent the rest of the tour congenially conjoined. David is a very friendly soul, and told me that I can include anything I want about him on my blog. This is naturally extremely exciting to me. 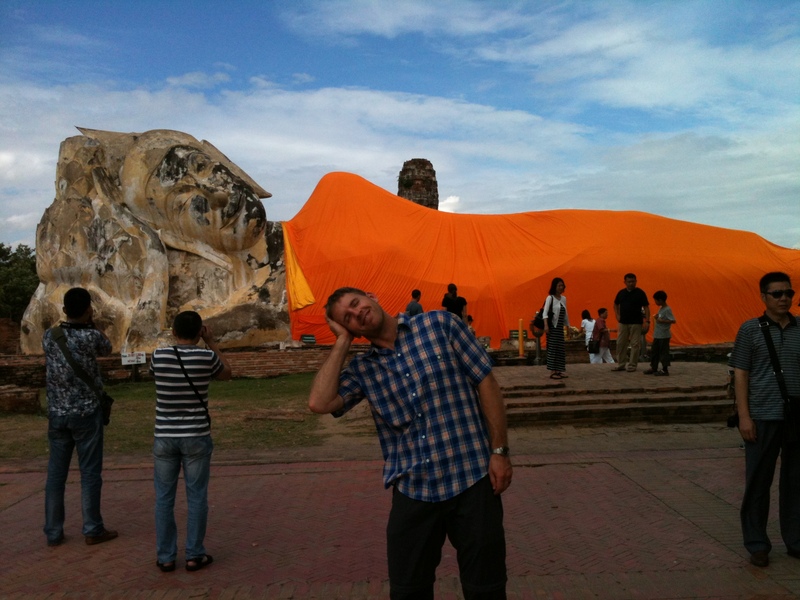 Our final stop of the day was the reclining Buddha. The government of Thailand allegedly draped him in a saffron robe to represent wisdom, thus creating a national mystery about what exactly is hidden under his robe. I tried to convince Todd to crawl under his robe and reveal said mystery, but he refused. Aww. You look tired. Why don’t you just curl up in his robe, Todd? After visiting three sites, the educators couldn’t handle any more education, and we crawled back into the bus. This time, my seat was without both legroom and headroom, so I pulled out my best not-so-secret talent, and scrunched myself into a pretzel in the back row. The Queen beamed benevolently at us from multiple highway shrines as the bus crawled back to the Big B.